Our yearly luxury weekend at the wonderful Ninderry Manor Bed and Breakfast on the Sunshine Coast trumped even last year’s magnificent experience. From the delicious sunset cocktails and artistic hors d’ouvres to the divine Japanese dinner cuisine dreamed up by Aki to the mouth-watering French inspired breakfasts, we and our friends were relaxed and pampered, enjoying the revitalisation of our friendship in the most elegant, inspirational surroundings. Each stylish bedroom has its charm and boasts as part of the fare a selection of bon bons, chocolates and after dinner port. 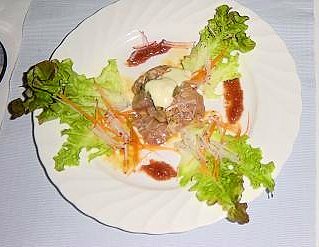 The Japanese dinner was absolutely heavenly and unforgettable – except for the names of the dishes! 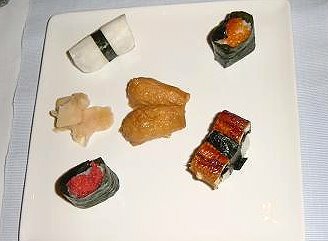 Yet incorporated into the superbly presented four course menu were my favourite food fetish – shitake mushrooms, along with scrumptious parcels of asparagus and beef and Aki’s dessert specialty – sesame seed homemade icecream amongst other delectable surprise fantasies. Nowhere else in our experience is food presented so artistically, and the flavours are just unbelievably unique and delicious. For the final breakfast, Aki presented us with another delight – caramelised fruit – to die for. We’ll be back – as soon as possible! Thanks to Aki, here’s the complete menu from our special fabulous dinner. Looks great. I will have to look into the easy Peasy cooking classes while I am there. Some of the food looks exquisite.